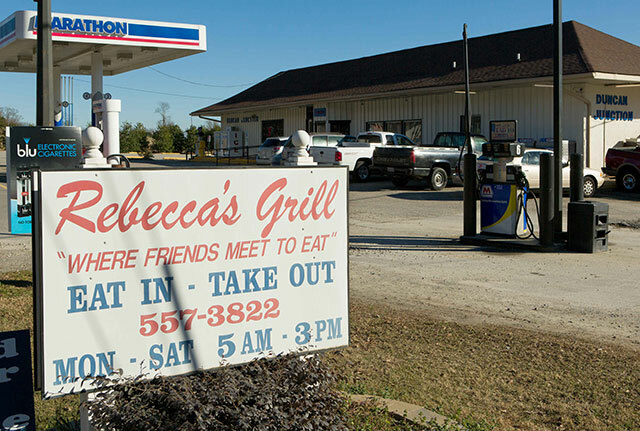 Situated inside the bustling Duncan Junction country store, a place that sells gasoline, fishing bait and cold beer, Rebecca’s Grill is a no-frills haven for anyone in search of a quality hot meal. Tables covered with classic red-checked gingham fill the dining area. Vintage tin signs prettify the walls. The faint clinking of video poker machines wafts in the backdrop. On any given day, you'll see overall-laden codgers sipping tea and coffee from foam cups, carrying on as if they don’t have a care in the world. Orders are taken at the counter, but experienced female servers take over from there. Tea is poured from a simple plastic pitcher, always with a courteous smile. 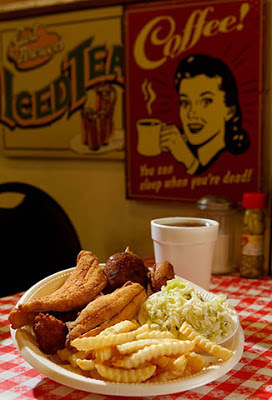 Among the hearty entrees available here are fork-tender BBQ pork ribs, country style steak, meatloaf and—on Fridays—fried seafood. Side items such as steamed cabbage, black-eyed peas, squash and mac & cheese are all reliable stocks-in-trade. Proprietor Edward King, who grew up in nearby Garner, named the establishment after his now college-aged daughter. His cooking is so well-regarded that he stays busy with catering events for churches and local businesses, never mind numerous pig pickin’s. As early as 5 a.m., customers arrive to get their fill of eggs, grits, hash browns, pancakes and other breakfast fare. Rebecca’s Grill is open for breakfast and lunch Monday through Saturday. Major credit cards are accepted. Sign up for your ZeroG travel arrangements is currently available. fake cartier How many Breitling’s constrained updates is fairly remarkable. With a level in which several may well ponder should they are really constrained! fake cartier Right after many Armed service and also Avenger collection, Breitling is currently again about the famous Navitimer, leaving behind to get a second the fied-ops interest for the natural-born traveling behavioral instinct. rolex replica sale Iconic inside the vintage model using a african american switch, tag heuer replica uk the particular Navitimer explores a lot more exceptional shades in the constrained collection featuring a bronze switch. rolex replica This kind of constrained model regarding 1000 parts reminds lovers with the Glowing blue Heavens model in which observed the particular mild regarding evening after some duration in the past for your 60th loved-one's birthday with the bit.